In late September, 1608, a courier arrived at the gates of the Spanish royal residence at Madrid after a journey of several days by road from the coast. He was carrying a dispatch to Philip III from Don Pedro de Zuniga, Spanish ambassador in London. It contained diplomatic intelligence that he believed would be crucial to Spanish efforts to protect their holdings in North America from encroachment by troublesome British competitors. Twenty years had passed since the unsuccessful attempt by Philip III's father, Philip II, to topple the Protestant Queen of England in the abortive naval invasion known in Spain as the 'Great Enterprise'. Now Elizabeth I was dead, and the crowns of Scotland and England had been united under James VI and I. Spanish unease with the British was now of a more commercial than religious nature, but relations were strained nonetheless, and the ambassador was assiduous in keeping his monarch up to date with worrying developments on both sides of the Atlantic; the previous year he had protested to James about the nascent English colonies of Virginia, and also urged Philip to take action against them - though the King chose not to act on his advice. The contents of Don Pedro's dispatch were eventually transferred to the royal archives in Simancas, where they were to remain undisturbed for nearly three centuries. When those documents were to come to light in 1888, they would initiate a chain of events leading to what is today one of the most significant archaeological projects of colonial America. For contained in the Zuniga dispatch from London were two maps documenting British efforts aimed at planting colonies uncomfortably close to the Spanish domains in the New World. The first was a general sketch of the Chesapeake Bay and its tributaries, where the British colony of Jamestown was in its infancy; the other a highly detailed plan of Fort St George at what has become known as the Popham Colony on the Kennebec river of Maine. Just how these maps came into the possession of the Spanish ambassador is not known, but espionage was a primary tool of diplomats in those days and it is likely the exchange of a few gold pieces was involved in the transaction. In the decades following the explorations of Columbus in the 1490s, the Spaniards had been largely free to develop their North American holdings without interference from the other European powers. Thanks to the intervention of Pope Alexander VI who had laid a dividing line between the two in 1494, the Portuguese and Spanish spheres of influence had been relatively well defined, and the consolidation of the Spanish and Portuguese crowns under Philip II in 1580 largely removed competition from that quarter. While Spanish power was firmly established in Mexico, Florida and Cuba, the king of Spain also laid claim to most of the coast of North America, despite maintaining no permanent presence along most of that coast. Other potential European competitors had not become very active in North America, some early exploratory moves notwithstanding. Both the English and French had been early visitors: the Bristol based John Cabot had reached Maine in 1498, while Giovanni da Verrazzano, sailing under a French flag, had explored the same region in 1524. Then, in 1562, French Huguenots under Jean Ribault established a colony, Port Royal, on Parris Island at the mouth of the St John River in what is now South Carolina. The Spaniards felt this colony, along with its fort, Charlesfort, represented a foothold perilously close to their interests in Florida, and in 1566 Don Pedro Menendez, governor at St Augustine, moved to eliminate the colony by force. Further north, Sir Walter Ralegh dreamed of an English colony at Roanoke on North Carolina's Outer Banks in 1585, but this disappeared after a few years. As the Sixteenth Century drew to a close, Spain could still claim most of North America as its own. By the early Seventeenth Century, however, both the French and the English were again active. To the north, Samuel de Champlain undertook extensive explorations of the St Lawrence River area between 1603 and 1607, and explored the coast of New England as far south as Cape Cod, before withdrawing to his base in Acadie (now Nova Scotia). In April 1606, James I signed the charter of the Virginia Company authorizing it to establish colonies in 'Virginia', indicating a vague area between Spanish Florida and French interests in Canada and including what is today considered New England. The Virginia Company was itself divided into two subordinate companies, one based in London, the other in Plymouth. The Plymouth Company was to exploit the northern part of the region while the southern part was assigned to the London Company. The royal charter envisaged a healthy competition between Plymouth and London, as it created an overlap in their assigned territories, with the more successful company to gain the lands contained in the overlap, i.e., the lands between 38 and 41 degrees north latitude. The two companies responded swiftly, each finding sufficient investors to send out expeditions before the end of the year. The Richard, sent by the Plymouth Company in August under the command of Captain Henry Challons, never reached its intended destination in what is now the state of Maine, being intercepted and captured by Spanish forces near Florida in November. The London expedition departed in December 1606 and arrived in the Chesapeake region, settling on what was to be named the James River on May 14th, 1607. After coming perilously close to failure during the early years, its colony at Jamestown survived and eventually grew to become a successful and lucrative asset of the British empire. Despite the initial setback, the Plymouth Company wasted no time in organizing its second expedition. It was financed in large part by two influential figures, Sir John Popham, Lord Chief Justice of England, and Sir Ferdinando Gorges, the military governor of Plymouth who had been involved in the promotion of previous explorations of North America. They agreed to appoint George Popham, the nephew of Sir John, as the first president of the colony. On May 31st, 1607, the ships Gift of God and Mary and John departed carrying some 120 colonists - a slightly larger group than had travelled from London to Jamestown. Unlike that rival expedition, the Plymouth group took just nine council members and half-a-dozen other notable gentlemen, with the majority being mainly soldiers, craftsmen, farmers and traders, their objective to reach the coast of 'North Virginia' at a latitude of about 43 degrees north. The Gift of God arrived at the mouth of the Sagadahoc River (now the Kennebec in Maine) on August 13th, and Mary and John followed three days later. 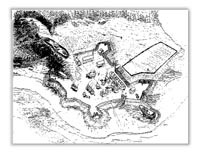 Popham immediately began establishing their colony within a fortification sited on the tip of a headland named Sabino, and which they named Fort St George, a site selected by an earlier reconnaissance expedition as a good base for further colonization to the north. With George Popham, the other leader was the admiral, Raleigh Gilbert, the son of Sir Humphrey Gilbert and a nephew of Sir Walter Ralegh. Gilbert was twenty-five years old and, according to contemporary reports, was rather proud and arrogant, 'desirous of supremacy and rule'. 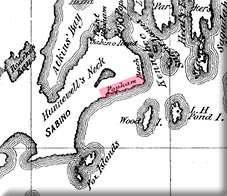 Popham and Gilbert sent survey expeditions up the river and contacted the Abenaki, a tribe belonging to the Algonquian peoples. In a letter to the King, Popham wrote that the natives had told them that the area was full of easily exploitable resources. However, the colony failed to establish cooperation with the tribe; they were suspicious because earlier expeditions had kidnapped natives to take home to England to show off to backers and the Royal Court. Late summer arrival meant that there was no time to farm for food. Half of the colonists returned to England in December 1607 aboard the Gift of God. Others faced a cold winter during which the Kennebec River froze. Fire destroyed the storehouse and its provisions which endangered the entire colony. Later excavation has hinted that there might have been other fires. Colonists divided into two factions, one supporting George Popham and the other Raleigh Gilbert. George Popham died on February 5, 1608, possibly the only colonist to die - a contrast to Jamestown which lost half its population that year. Raleigh Gilbert took over the role of "colony president" on February 5, 1608 at the age of just 25. The colonists completed one major project: the building of a 30-ton ship, a pinnace they named Virginia. It was the first ship built in America by Europeans, and was meant to show that the colony could be used for shipbuilding. They also finally managed to trade with the Abenaki for furs and gather a cargo of wild sarsaparilla. When a supply ship came in 1608, it brought a message that Sir John Popham had died. Gilbert sent the Mary and John to England with cargo. When the ship returned later in the summer, it brought news that Gilbert's elder brother John had died. Gilbert was therefore an heir to a title and the estate of Compton Castle in Devon. He decided to return to England. The 45 remaining colonists also left, sailing home in the Mary and John and Virginia. The Popham endeavour illustrated the difficulties in Trans-Atlantic colonisation for the English. Dazzled by the success of Spanish and Portuguese colonial enterprises, the English had been too optimistic with their own plans. They had forgotten that the Spanish and Portuguese attempts had been no overnight success and had taken years of bitter commitment to come to full fruition. The English had also come across disparate and nomadic political entities unlike the Centralised powers of Central and Southern America that the Spanish had stumbled across. Furthermore, the extreme weather patterns of Maine and North America had come as a complete surprise to the would-be settlers. Having said all that, the failure of this scheme did not halt further schemes, if anything it whetted the appetites of colonists who dreamed of converting the resources of the New World into profit of one form or another. Although the Plymouth Company was financially undermined by this failed enterprise, many of the original backers were happy to invest into future colonial enterprises in North America. Popham had been a failure, but a tantalisingly close one and one that taught much to all of those involved.